Distinguished Service Order. British military decoration awarded to officers who have performed meritorious or distinguished service in war. The decoration, instituted by Queen Victoria in 1886, entitles recipients to add D.S.O. after their names. Foreign officers associated with British forces can become holders of the award as "honorary members." 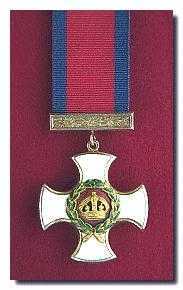 The badge of the order is a white and gold cross with a red centre bearing a crown surrounded by a laurel wreath.